AccleDent is a simple to use hands-free device that safely and comfortably speeds up tooth movement for orthodontic patients wearing braces or clear aligners. 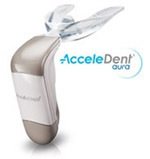 Clinically proven to move teeth up to 50% faster, AcceleDent is worn for just 20 minutes per day. Both lightweight and portable, it can be used without disruption to most daily activities. Using the patented SoftPulse Technology®, AcceleDent applies precisely calibrated gentle vibrations called micropulses to the teeth to increase the cellular activity required for orthodontic movement. Guided by the braces, AcceleDent accelerates tooth movement to achieve quicker results of care. As a safe and effective method of promoting quicker smile alignment, AcceleDent has also been clinically proven to significantly reduce the discomfort associated with braces as well as the other oral health issues that may result from longer treatment times. AcceleDent can be used by orthodontic patients of all ages and can be conveniently paired with a useful app to track and maximize the experience.